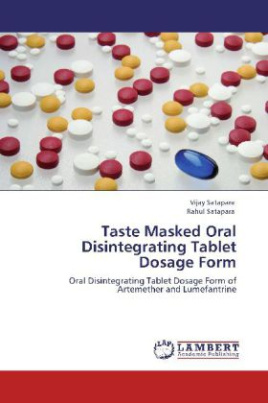 The purpose of this research was to mask the intensely bitter taste of Lumefantrine and to formulate oral-disintegrating tablet (ODT) of Artemether & Lumefantrine. Taste masking was done by complexing Lumefantrine with amino alkyl methacrylate copolymer (Eudragit E - 100) using solvent deposition method and acetone as a solvent for pH-sensitive polymer and was tested for drug content and in vitro taste in simulated salivary fluid (SSF) of pH 6.8. The complex with drug polymer ratio of 1: 0.1 that did not release drug in SSF was considered taste-masked and selected for formulation of ODTs.